This is the product of some work over this winter, starting with a few subs at Calstar 2013 and continuing into January and February 2014. Challenge with this target was the flare from the nearby star Propus. It causes an orange glare across the field, centered on a corner of the image, depending on which side of the meridian the camera is positioned. I've added some more flocking to the flattener. As I am unable to disassemble the flattener, I'll be experimenting with "lens hood" designs to eliminate the off-axis glare. Normal configuration for my digital astrophotos: Stellarvue SV4 with the SSF6 flattener. What varied was the use of the filters in place. At Calstar, 4 subs were just using the B+W 486 UV/IR filter. At Montebello OSP on Jan 31, a stack using the IDAS HEUIB II filter with the IDAS LPS P2 filter. At Montebello OSP on Feb 24, a stack using just the IDAS LPS D1 filter. Used a total of 32 subs for 10 hours 42 minutes of integration. 1200 second subs. Camera temperature was run wide open. Ambient temperatures varied - at Calstar, the temps were just above freezing. At MBOSP, the ambient temps were about 50 F. In both cases, I was able to use camera darks in the 7-10C range. Calibrated using Maxim with a library of darks, bias, and flats from each night. Processed in PixInsight. Steps used were crop, DBE, masked stretch, histogram stretch to set black point, masked MT, then unmasked curves to reset black point and boost saturation, masked unsharp mask to boost sharpness on the brightest features. I did not use the noise control features of PI because the data was very clean. Field of view ..... 1d 51' 38.2" x 1d 14' 42.7"
I've been working on the Monkey Head nebula for a little while and have noticed a consistent challenge of flare from Propus casting a gradient and reflection rings across the field. I first noticed this issue at Calstar. I figured then that it would be less of an issue once I gathered more subs. Note that during the Calstar example as seen above, the only filter used was the B+W 486 UV/IR. Note the orange flare across the frame from the lower left upwards. Also notice the two rings at the corner. Gemini to Orion on E200, a photo by S Migol on Flickr. 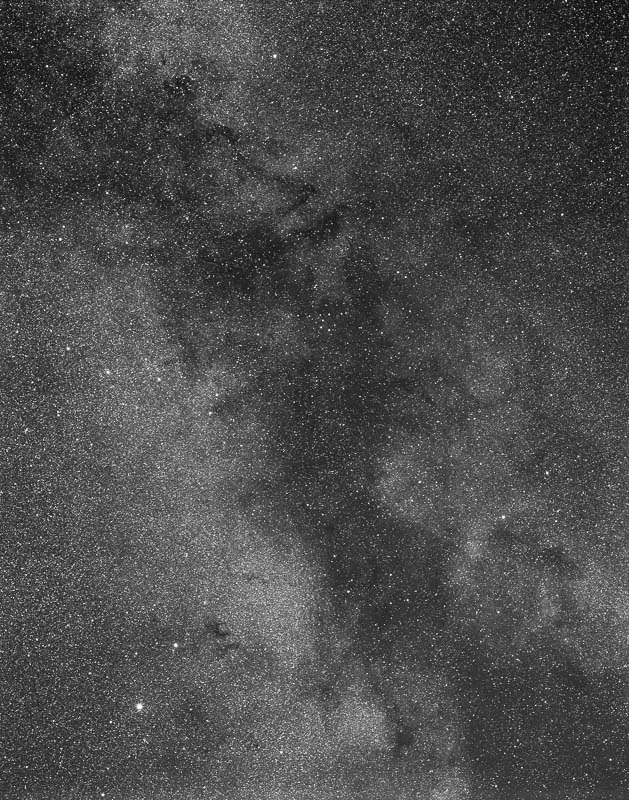 A widefield image taken at Calstar 2013 showing the dark clouds of the Milky Way and large nebulosity at the feet of the twins of Gemini towards Orion. The frame is centered on the Monkey Head nebula. Also seen are Jellyfish nebula. The two large areas of reddish glow are Sh2 264 and Sh2 273. Gemini to Taurus on Acros, a photo by S Migol on Flickr. 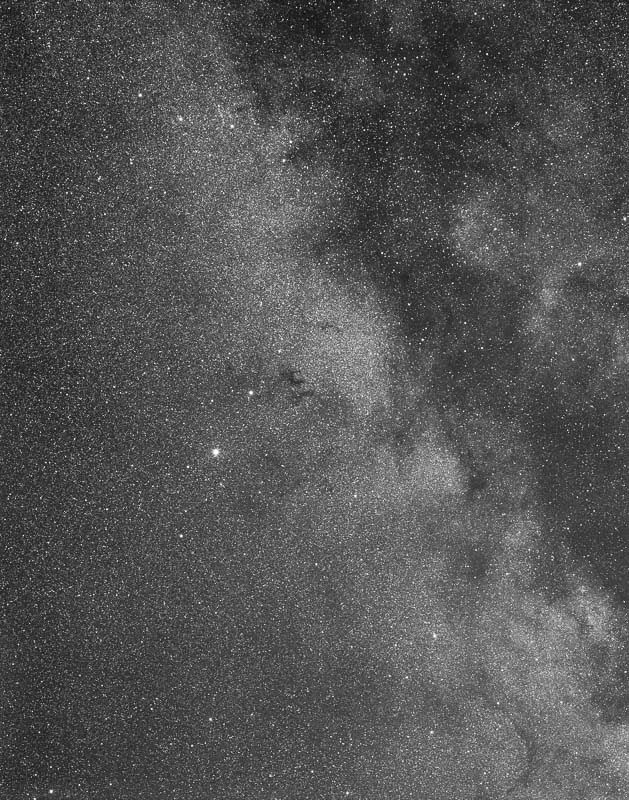 A widefield image taken at Calstar 2013 showing the dark clouds of the Milky Way from Gemini to Taurus between Orion and Auriga. 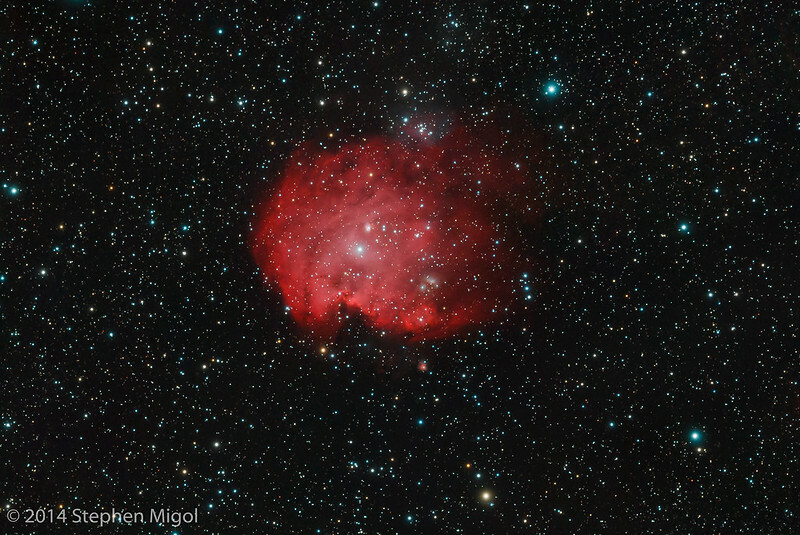 The field is centered on IC 2159 or the Monkey Head Nebula. This cloud of glowing gas was recorded on the film, a surprise considering the relative insensitivity of the film to Ha. Compare it with the Jellyfish Nebula near Propus. The latter nebula is nearly invisible. Also visible are several open clusters including M35.